This pre-deployment session was so much fun! When I received a session inquiry from this family, I was overjoyed to discover that we all went to the same university! Small world, huh? Not only that, but they were a dual military couple as well! The term "dual military" is used to describe a married couple who both serve in the military at the same time. It's super stressful and tiring, and requires a lot of patience and grace. At any time, one – or both – person(s) can be deployed, in addition to the regular expectations of early morning physical training, late night work, irregular hours, and field training exercises. 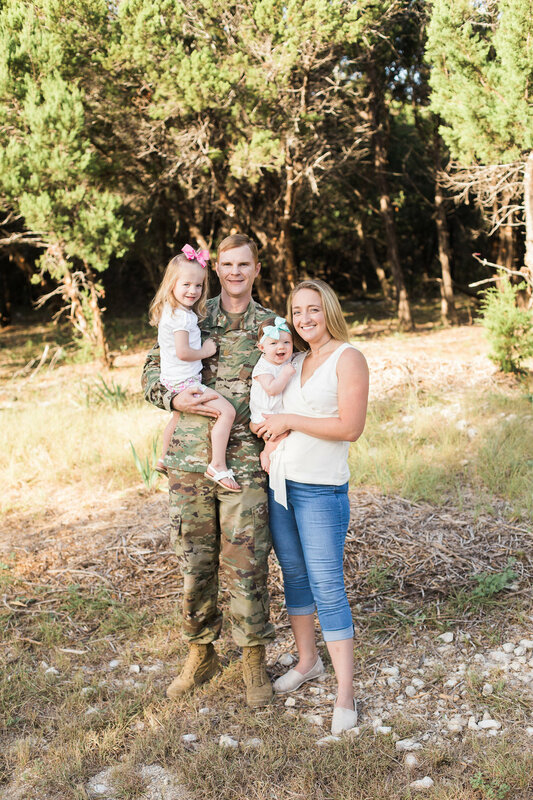 A large unit is scheduled to deploy out of Fort Hood and this family wanted to capture photos of their family beforehand. This soldier will go on his fifth (5th!) deployment, but the first one since their children have been born. And to boot, they just moved here a few months prior! If army life teaches you anything, it's to be adaptable! Thanks for reading! Also, if you would, please take a moment to pray for this family, all the deployed soldiers and their families at home, for those in service toward our nation and to peace, and for our leaders in government.